A mild-mannered North Carolinian from a mill town would strike few as a world-renowned, influential musician and composer. Earl Scruggs, once compared to violinist Niccolo Paganini, not only pioneered the three-finger banjo but played it to standards of taste and technique unmatched by thousands of disciples over seven decades. He was an important figure in the birth of the bluegrass genre, and also brought his artistry to the fields of country, folk, and rock, to college campuses, and to television and the movies. Earl Scruggs’ father was an old-time banjo player, but died when Earl was four. Older brother Junie, who also played banjo, had moved out on his own before Earl developed his early musical interests into a style around 1934. Brother Horace, a guitarist, and neighbor Dennis Butler, a fiddler, were the young man’s earliest jamming partners. 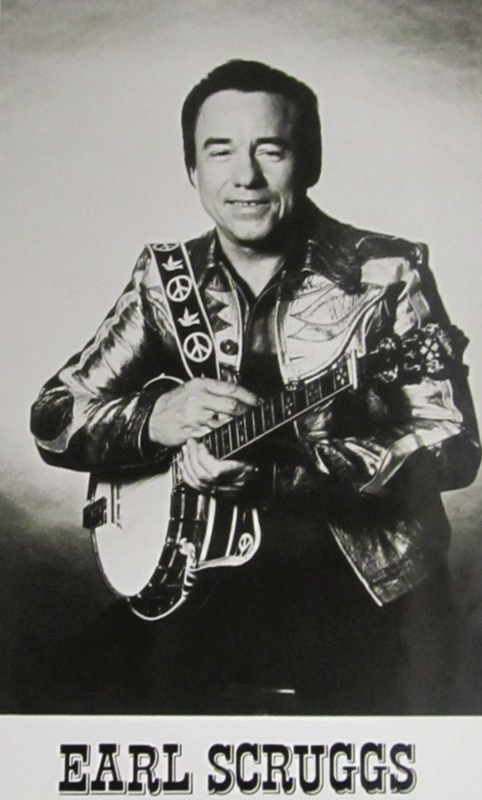 By the age of 13, he had purchased his own banjo and by 15 he was performing professionally on the radio. Music and millwork alternated until Scruggs decided to become a professional performing artist at the end of World War II. After a brief stint with “Lost” John Miller and the Allied Kentuckians, which brought him to Nashville, Earl Scruggs auditioned and was accepted by Bill Monroe and the Blue Grass Boys. Lester Flatt, Chubby Wise, and Howard Watts, Earl and Bill made up the classic edition of that band between summer, 1945, and spring, 1948. Surviving airchecks from Grand Ole Opry performances document the electrifying effect the act had upon audiences. The warmest ovations greeted Earl’s radically new banjo solos — the loudest, fastest, and smoothest anyone had ever heard. Announcer George D. Hay took to giving “Earl Scruggs and his fancy banjo” equal billing with bandleader Bill Monroe. Tired of the constant touring, Flatt and Scruggs resigned and decided to seek local radio work in a succession of southern markets. They built a band called the Foggy Mountain Boys (named after a Carter Family song, “Foggy Mountain Top”), and populated it mostly with fellow alumni of the Blue Grass Boys. Mercury and Columbia recording contracts were negotiated, and the banjo was prominently featured on 78 and 45 rpm singles released just as DJ radio and jukeboxes came into popularity. The band worked territories around Danville, Virginia; Hickory, North Carolina; Bristol, Virginia/Tennessee; Lexington, Kentucky; Tampa, Florida; Roanoke, Virginia; Raleigh, North Carolina; Knoxville, Tennessee; and Richmond/Crewe, Virginia – spawning banjo enthusiasts and future banjo stars at every stop. In 1955, at radio sponsor Martha White Mills’ insistence, the Foggy Mountain Boys were added to the Grand Ole Opry roster and were henceforth based in Nashville. Prominent members of the band included guitarists Jim Eanes and Mac Wiseman; mandolinists Curly Seckler and Everett Lilly; fiddlers Benny Sims, Benny Martin, and Paul Warren; bassists Jody Rainwater and Jake Tullock; and Dobro player Josh Graves. Ironically, given their earlier desire to reduce touring, Flatt and Scruggs did the most traveling of any Opry act in the 1950s, covering both live performances and a circuit of radio and television stations in the days before technology supported syndication. Widely popular for an energetic and thoroughly rural style centered on Earl’s riveting banjo, they thrived during the early rock ‘n roll era when many of their bluegrass and country contemporaries struggled. Shrewd business manager Louise Scruggs helped Flatt and Scruggs to capitalize upon a string of important opportunities. These included the sound track and appearances in television’s “Beverly Hillbillies,” concerts at colleges and other venues associated with the folk music boom, capitalization on use of “Foggy Mountain Breakdown” in the movie “Bonnie and Clyde,” and material from new songwriters such as Bob Dylan, Johnny Cash, Tom T. Hall, and Utah Phillips on the band’s Columbia LPs. Earl’s growing interest in new musical genres and in performing with sons Gary, Randy, and Steve led to a parting of the ways with Lester Flatt in 1969. For a decade, the Earl Scruggs Revue was a popular act, mostly in youth markets, including scores of college appearances. Musicians such as Charlie Daniels, Jody Maphis, Josh Graves, Vassar Clements, Lea Jane Berinati, and a procession of musical celebrities enhanced the long-haired sons’ country rock. 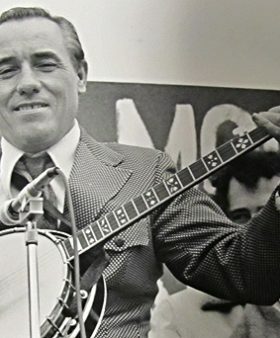 Banjo icon Earl Scruggs remained the center of audience and media attention, changing his style very little. Health challenges led to Earl’s retirement from the road in the late 1970s. The public never lost its fascination for Earl Scruggs. Jam sessions at Earl and Louise’s house in Madison, Tennessee, continued to attract the A-list of performers from bluegrass and related genres throughout the eighties and nineties. Occasional guest appearances with artists like Ricky Skaggs and Tom T. Hall kept him in the recording game. In 1997, bolstered by recent advances in pharmaceuticals and medical care and a huge market demand, Earl decided to accept a limited number of personal appearance dates, media appearances, and CD projects. All have been hugely successful. 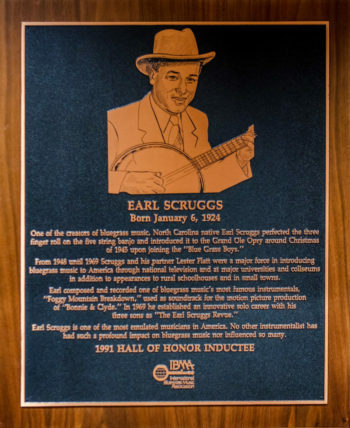 Widowed at the age of 82, Earl Scruggs continued to receive accolades from new generations as well as surviving contemporaries from the dawn of the bluegrass era. Finger-picked guitar on gospel and Carter Family songs, to differentiate the Foggy Mountain Boys’ sound from Bill Monroe’s. Wrote the banjo instrumental “Randy Lynn Rag” in honor of Randy Lynn Scruggs’ birth in 1953. Wife Louise Scruggs (1929-2006) was the first prominent female business figure in country music. Piloted his own plane to distant concert appearances, beginning in 1957. Wrote “Earl Scruggs and the Five-String Banjo” and invented Scruggs tuners, used to accurately and quickly change a string’s pitch during performance. Spoke publicly against the war at the 1969 US Vietnam Moratorium in Washington, DC. A catalyst in organizing appearances by country music legends on the Nitty Gritty Dirt Band’s historic “Will the Circle Be Unbroken” album, 1971. 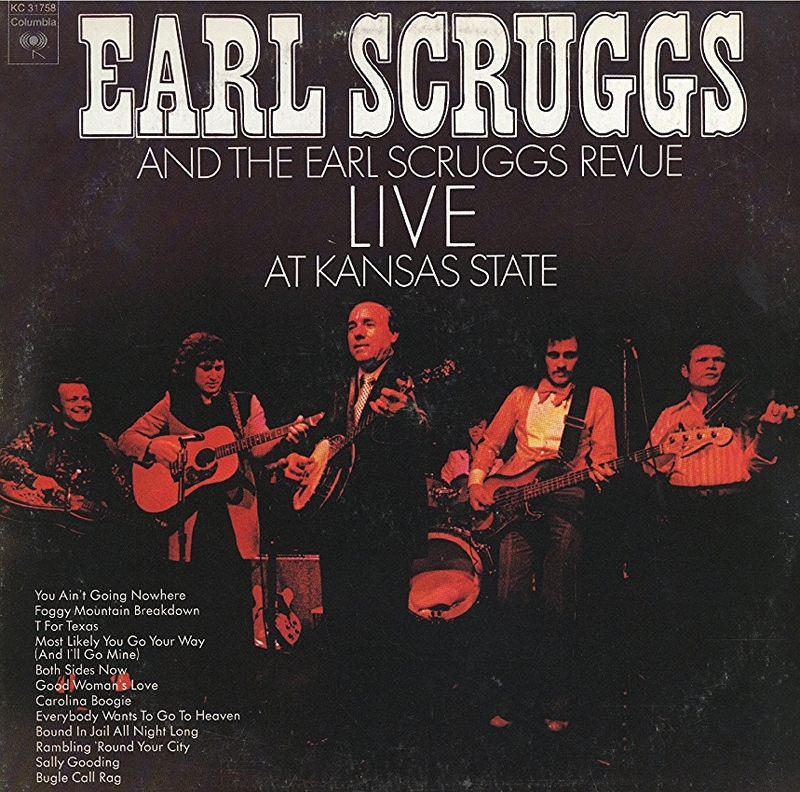 From the Archives: Album by Earl Scruggs and the Earl Scruggs Revue Live at Kansas State. Donated by Henry Horrocks. 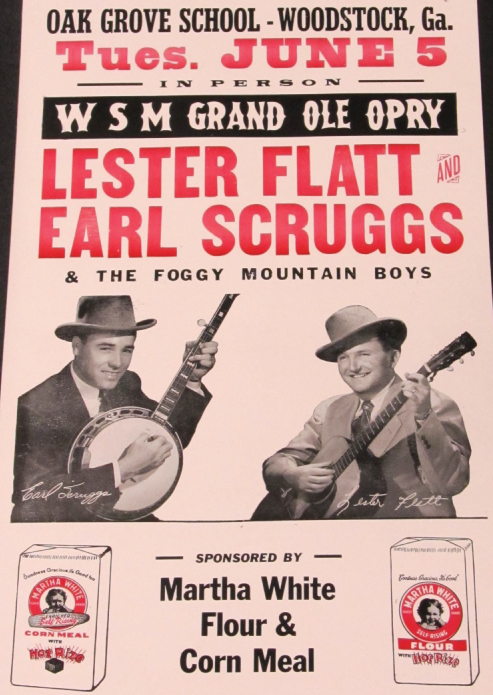 From the Archives: Concert poster for Flatt & Scruggs, sponsored by Martha White Flour & Corn Meal. From the Archives: Promotional photo of Earl Scruggs created by Columbia Records. Donated by Raymond Huffmaster. 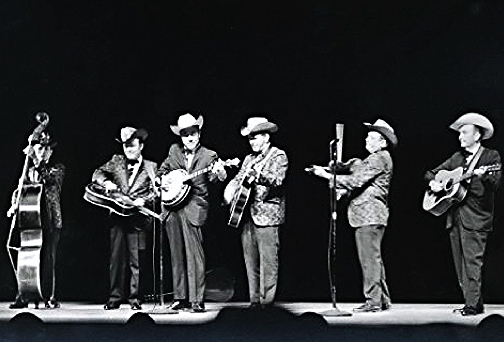 From the Archives: Lester Flatt and Earl Scruggs with the Foggy Mountain Boys at the Place des Arts, Montreal, Canada 1968. Photo by Ron Petronko. Quoted in Willis, Barry, America’s Music: Bluegrass, 1989.